Brazil is located in the eastern coast of South America, sharing land borders with Uruguay in south; Argentina and Paraguay to the southwest; Bolivia and Peru to the west; Colombia to the northwest; and Venezuela, Guyana, Suriname and the French overseas department of French Guiana to the north. Its lies between latitudes 6°N and 34°S, and longitudes 28° and 74°W'. 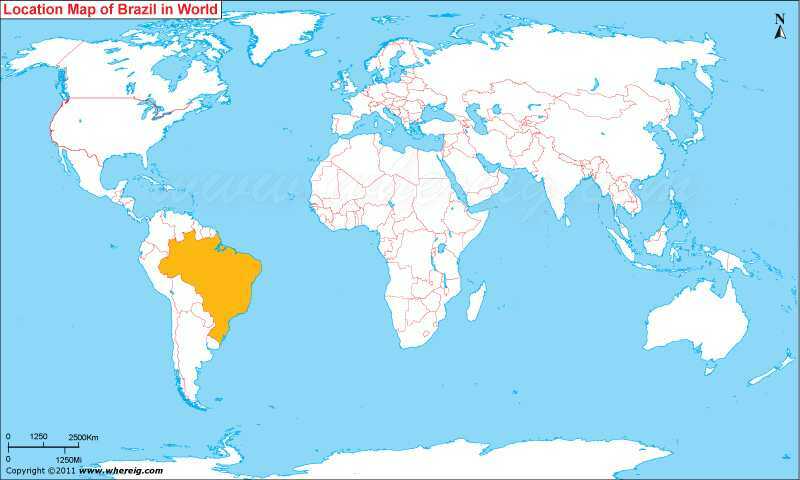 About Map: Map showing location of Brazil in the World. Brazil is the largest country of South America and fifth largest country of the world. Brazil is the only Portuguese speaking country on the land of South America continent. Brazil shares its international boundaries with almost all South American countries other than two i.e. Ecuador and Chile. As shown on the Brazil map that it shares its international boundaries with Venezuela, Guyana, Suriname and the French overseas department of French Guiana in the north; Colombia in the north west; Bolivia and Peru in the west; Argentina and Paraguay in the south west, and Uruguay in the south. Besides, it has long coastline made by Atlantic Ocean form eastern side. The country has gotten its independence from Portugal in the year 1822. At present, government type of Brazil is Federal Republic, which is constituted by the union of the Federal Districts i.e. the 26 States, and the 5,564 Municipalities. Besides, Brazil is a founding member of many international organizations including the United Nations, the G20, Latin Union, the Organization of Ibero-American States, CPLP, Mercosul and the Union of South American Nations etc. Due to vast area of the country, the climate type of Brazil varies greatly; however, largely it is considered as tropical climate. Brazil has huge territory consisting of various ecosystems, such as the Amazon Rainforest, recognized as having the greatest biological diversity in the world and the world's biggest river Amazon in terms of volume passes through the middle of the Amazon forest. Brazil is also home of a diversity of wildlife, natural environments, and extensive natural resources. According to the GDP, the Brazilian economy is the eighth largest economy in the world and the seventh largest in terms of purchasing power parity. Brazil has large and developed agricultural, mining, manufacturing, and service sectors. Besides, it has large natural reserves and advanced technologically developed industries including aircraft and automobile.